New research from Caltech and NASA offers an explanation for the “missing” carbon in the Martian atmosphere, showing that a transition from a moderately dense atmosphere to the current thin one is entirely possible. The solar wind stripped away much of Mars’ ancient atmosphere and is still removing tons of it every day. But scientists have been puzzled by why they haven’t found more carbon — in the form of carbonate — captured into Martian rocks. They have also sought to explain the ratio of heavier and lighter carbons in the modern Martian atmosphere. Now a team of scientists from the California Institute of Technology and NASA’s Jet Propulsion Laboratory, both in Pasadena, offer an explanation of the “missing” carbon, in a paper published today by the journal Nature Communications. They suggest that 3.8 billion years ago, Mars might have had a moderately dense atmosphere. Such an atmosphere — with a surface pressure equal to or less than that found on Earth — could have evolved into the current thin one, not only minus the “missing” carbon problem, but also in a way consistent with the observed ratio of carbon-13 to carbon-12, which differ only by how many neutrons are in each nucleus. When considering how the early Martian atmosphere might have transitioned to its current state, there are two possible mechanisms for the removal of the excess carbon dioxide. Either the carbon dioxide was incorporated into minerals in rocks called carbonates or it was lost to space. An August 2015 study used data from several Mars-orbiting spacecraft to inventory carbonates, showing there are nowhere near enough in the upper half mile (one kilometer) or the crust to contain the missing carbon from a thick early atmosphere during a time when networks of ancient river channels were active, about 3.8 billion years ago. The escaped-to-space scenario has also been problematic. Because various processes can change the relative amounts of carbon-13 to carbon-12 isotopes in the atmosphere, “we can use these measurements of the ratio at different points in time as a fingerprint to infer exactly what happened to the Martian atmosphere in the past,” says Hu. The first constraint is set by measurements of the ratio in meteorites that contain gases released volcanically from deep inside Mars, providing insight into the starting isotopic ratio of the original Martian atmosphere. The modern ratio comes from measurements by the SAM (Sample Analysis at Mars) instrument on NASA’s Curiosity rover. One way carbon dioxide escapes to space from Mars’ atmosphere is called sputtering, which involves interactions between the solar wind and the upper atmosphere. NASA’s MAVEN (Mars Atmosphere and Volatile Evolution) mission has yielded recent results indicating that about a quarter pound (about 100 grams) of particles every second are stripped from today’s Martian atmosphere via this process, likely the main driver of atmospheric loss. Sputtering slightly favors loss of carbon-12, compared to carbon-13, but this effect is small. The Curiosity measurement shows that today’s Martian atmosphere is far more enriched in carbon-13 — in proportion to carbon-12 — than it should be as a result of sputtering alone, so a different process must also be at work. Hu and his co-authors identify a mechanism that could have significantly contributed to the carbon-13 enrichment. The process begins with ultraviolet (UV) light from the sun striking a molecule of carbon dioxide in the upper atmosphere, splitting it into carbon monoxide and oxygen. Then, UV light hits the carbon monoxide and splits it into carbon and oxygen. Some carbon atoms produced this way have enough energy to escape from the atmosphere, and the new study shows that carbon-12 is far more likely to escape than carbon-13. Modeling the long-term effects of this “ultraviolet photodissociation” mechanism, the researchers found that a small amount of escape by this process leaves a large fingerprint in the carbon isotopic ratio. That, in turn, allowed them to calculate that the atmosphere 3.8 billion years ago might have had a surface pressure a bit less thick than Earth’s atmosphere today. 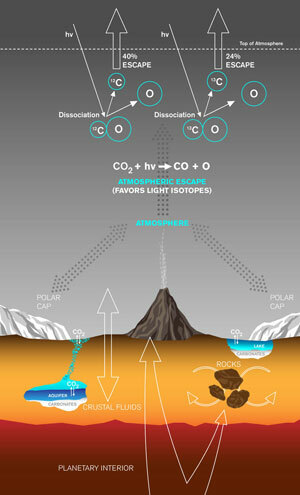 1 Comment on "New Research Explains Loss of Carbon in Martian Atmosphere"
Carbon 13 should be more enriched than Carbon 12 which is found in our earth, in Mars, because CO2 the carbon-di-oxide is heavy enough to fall on the planet surface and it would not be easily carried away from the atmosphere. Carbon is assimilated in the ground as carbonates and that is why Mars is having thing atmosphere. H2. O2, CH4 and H2O can drift away from atmosphere but not CO2. You don’t get thick clouds around Mars and it is giving a transparent image with CO2 thin atmosphere. If all organisms on our Earth perish one day, and fill the atmosphere with CO2, the predominant green house gas, earth will also present cloudless Mars like feature then. In all probability Mars was once bubbling with life with sufficient water like earth today, when the temperature was livable there. At that time earth should have been hot furnace like Venus and Mercury. Much of the cloud of NH3, and CH4 we had then had gone to earth to produce plants and animals. Oxygen slowly increased by plants and size of the animals also diminished since they no longer require huge lungs to breathe the less content of oxygen in the atmosphere. Thank You.